It’s been a little over four weeks since I moved out of Stage Left Studio, and began my loveandworktour. I am getting used to my new status as a woman on the road, living out of suitcases, and finding ways to manage my business without having an office, a bedroom, all the vast setup that has been essential to my life for the last ten years. It’s an adventure of its own, creating new systems, assigning values, and finding out where things go. I’m learning how to be efficient with this new much-smaller footprint that I will occupy for the next year. Everything I do now needs to fit inside my car. The stairway I’m referring to was a lonely stairway accessible from the fire escapes on each floor. We found it right after I moved in. The door leading off of my balcony had a large bolt, which we whacked until it loosened, and then we opened the door onto this black yawning cavern. It was very creepy in the light from our flashlight and what little light spilled into it from the balcony. 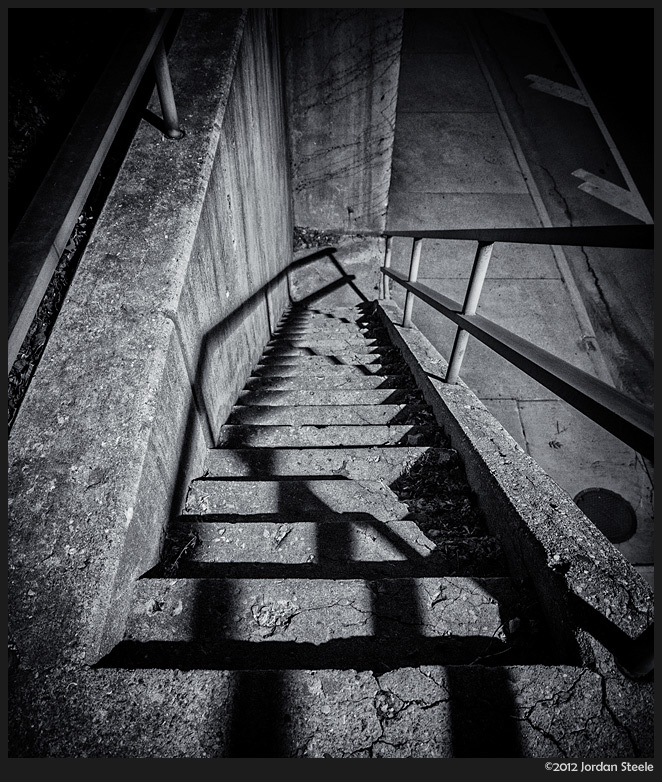 You could imagine some maniac with a mask and a buzz saw looming out of the darkness, so TC dubbed it “The Stairway of Death”. We ended up using the landing there to store spare pots, potting soil, and other gardening materials, and as our place to do projects that we couldn’t do indoors, like spray painting, cutting wood, stuff like that. “You can paint that on the stairway of death,” we’d say to our interns. Then they’d give us a funny look, and we’d have to tell them the story. Eventually, after a routine inspection from the fire department, the super replaced the light bulbs on the landings, and it wasn’t very creepy any more, but we liked having a stairway of death, so the name stuck. Now that I have removed everything I put out there, it will probably remain unvisited again for years, until another tenant goes out there, finds the light bulb burned out, and it regains its former creepiness. My memories of Stage Left run the gamut from my quirky fondness for the Stairway of Death, to my joy at greeting the audience, to my helpless frustration with the elevator that went out on a semi-regular basis. They are as jumbled as my pile of documents that needs sorting. But that’s one good thing about the 2000 miles I’ll be driving in the next month. As I travel that thin white line, I’ll be looking at Stage Left Studio from the perspective of hindsight. Finally off the treadmill of running the venue, I’ll be able to see more clearly what I accomplished there. There are aspects that loom large – the enormous community of artists that developed in the space, the body of work I produced, the companies of actors that will continue to perform together in shows I’ll produce at 13th Street Rep and at other venues. There are the routines I cherished, locking the elevator door after waving goodbye to my buddies TC and Bill, and turning out the lights in the lobby. In the spill of light from the LED billboards on 33rd Street, I’d gaze at folded and spindled programs on the chairs in the theater. Stepping into the green room, I’d turn out the lights at the dressing table, feeling the energy of the actors who prepared there. And finally, making my way into my bedroom down the hall, I’d settle down into my big chair, setting aside the theater owner persona, I’d become just me, resting after my day, and grateful for this wonderful life.